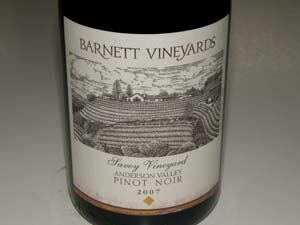 There are special vineyards in California that have proven over time to possess exceptional terroir for Pinot Noir. In the Anderson Valley of California, Savoy Vineyard is one such vineyard that is among the most recognizable names in this appellation. Located northwest of the town of Philo, the vineyard lies at the base of the hills and comprises the last knolls as well as the gently sloping terraces below them which lead eventually to the Navarro River which flows through part of the Anderson Valley. The vineyard is protected on two sides, one by the aforementioned hills and on the Southeast by a little rise which leads into Philo. The result is that the vineyard, although situated in the cooler end of the Anderson Valley, is warmer than most of its neighbors. Refer to red “A” below. Rich Savoy and Ted Lemon (Littorai), who has crafted Savoy Vineyard Pinot Noirs since the mid 1990s and was the first to vineyard designate the site several years before anyone else, provided me with detailed information about Savoy Vineyard. Like any vineyard of size, their are differences in the terroir in various portions of the site. The knolls are generally composed of sandy loams weathered from sandstone. They have moderate moisture holding capacity and moderate to very low vigor. 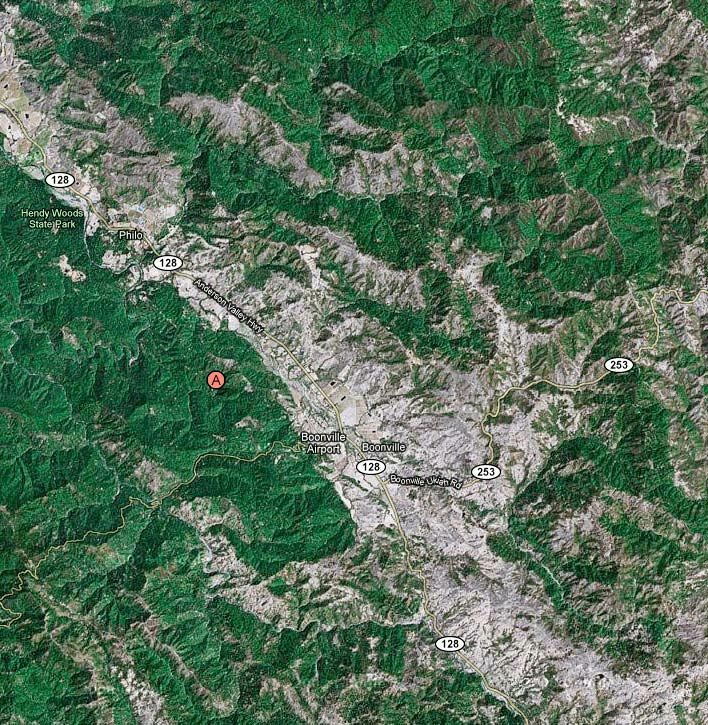 The alluvial terraces are more darkly colored loams underlain with clay loams. The higher clay content of these terraces means that they have higher moisture holding capacity and moderate vigor and some of the areas within the terraces may soon be dry farmed. The Littorai sections contain both soil types and several clones including 114, 115, 667, 777, Pommard and Calera. For the 114, 115 and Pommard, these sections have been the same since they were originally planted in 1992. The 114 section has been dry farmed for many years, the 115 and Pommard receive minimal irrigation (between 6 to 12 gallons per vintage). Ted hopes to dry farm these sections in the next few years. Noted viticulturist, Paul Ardzrooni, took a long term lease on the site from Rich following the 2007 vintage. Paul is now the active farmer, but he continues to work closely with Rich who contributes years of experience with the site. 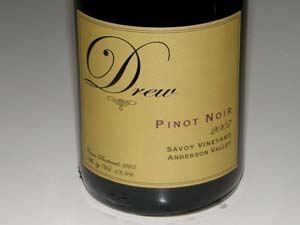 In the 2007 vintage, Savoy Vineyard Pinot Noir was bottled as vineyard designates by Adrian Fog, Barnett Vineyards, Benovia, Breggo Cellars, Drew, Littorai, Radio-Coteau and Roessler Cellars. I sampled each of these wines recently and tasted them blind. 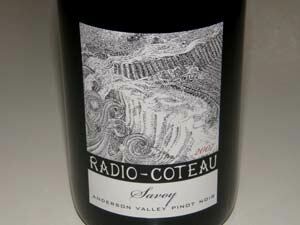 The Savoy Vineyard Chardonnay was sourced by Barnett Vineyards, Breggo Cellars and Radio-Coteau. Rich Savoy said the 2007 vintage "was a more intense year, but balanced, with low crop loads." The Savoy Vineyard designation on a label is a stamp of superior quality. Generally, darker fruits are evident, tannins provide good structure and age ability, and bright acidity complements the fruit. The wines are long in the mouth and vigorous with flavor and character. The wines can be serious, structured and assertive in their youth, but soften and integrate beautifully over time. 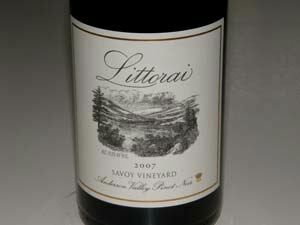 I have sampled Littorai Savoy Vineyard Pinot Noirs back to 1996 and can vouch for their age ability in the hands of a talented winemaker. 14.8% alc., $35. · Pale yellow color the glass. Expressive scents of pears, lemon curd and butter leading to flavors of white stone fruits, citrus and roasted nuts. The hioctane creates a plushness on the palate and the lively acidity leads to an appealing citric lift on the crisp finish. Barrel-fermented Chardonnay lovers will find this wine very appealing especially considering the price. This wine delivers a $60 experience. The 2006 vintage, which is still available in some retail markets, is equally good or better as it offers a little more richness. Very good. 14.3% alc., 273 cases, $43. · Moderately reddish-purple robe. Fruity nose showing dark berry jam and a touch of spice box. 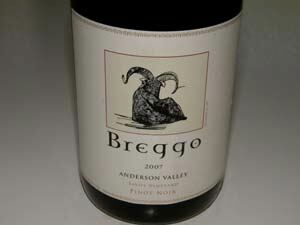 Vivid and fresh dark red fruits fill the midpalate complimented by an appealing earthiness. The tannins are dry and fine, the texture is satiny, and the finish is clean and lengthy. The balance is admirable. Relatively forward and drinkable now. Very good. 13.9% alc., 225 cases, $45. · Deep and rich aromas of berry tart with nuances of oak, smoke, raisin and green garden. Vivid core of raspberry fruit with bright acidity, mild astringent tannins, impressive body and viscosity, and a dry, generous finish. Tastes slightly riper than several other Savoy Pinots in this vintage. Very good. 14.5% alc., 414 cases, $46.50. · Moderately dark reddish-purple robe. Redder tones of fruit predominate in this impressive wine. Hi-tone cherries and raspberries on the nose with baking spice and coconut in the background. Discreet but charming flavors of cherries and red licorice with an appealing viscous texture, supple tannins, and admirable persistence on the finish. A purist may find this wine too fruity, even a little confected, but I enjoyed it immensely. Very fruit-forward and showy at this early stage. 14.2% alc., $49. · Restrained aromas of black cherries, dark red berries and blueberries. The cherry and berry core is withdrawn and inexpressive. Mild tannins create a soft drinking experience and the tangy finish offers a hit of citrus peel. Just not exciting now and seems to be going through a dumb phase. Decent (+). 14.7% alc., 536 cases, $50. · Dark-purple color in the glass. A riper toned nose featuring blackberries, prune, and a touch of cardamon spice. The hedonistic core of ripe, sweet berries has undertones of forest floor and woodshed. Over time, oak threatens to dominate the aromas and flavors. Time is needed to shed the healthy tannins and hopefully integrate the oak. Decent (+). 14.1% alc., $55. · Intensely fruity nose with scents of blackberries, raspberries, plums and a whiff of mocha. A seamless wine with an earth-kissed dark fruit core that is discreetly rich and crisp, leading to a smooth, long and satisfying finish. Even better and highly seductive the next day from a previously opened and re-corked bottle. If you drink now, decant. 13.5% alc., $60. · An impressive nose that builds and builds in intensity over time in the glass featuring black cherry fruit with a subtle hint of oak. Very tasty black cherry bombast with firm, fine-grain tannins, an appealing touch of earthiness, a silky mouthfeel and a memorable aromatic finish. This wine shows Ted Lemon’s signature: perfectly harmony. This brilliantly crafted wine continues to open in the glass over time demanding your attention. Approachable now, but patience will be rewarded. 14.5% alc., 320 cases, $70. · Dark reddish-purple color in the glass. 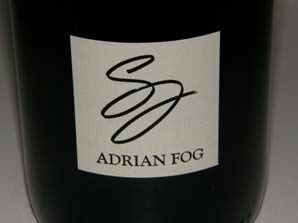 The nose is quite lovely initially showing plum and berry fruit with hints of oak and fennel. Over time, more floral aromas emerge, the fruit fades and a hint of alcohol appears. 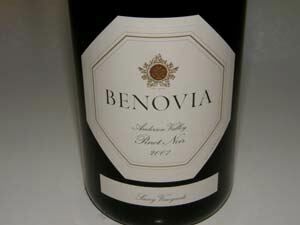 A medium-weighted wine with plum and blackberry fruit that is juicy, mineral-toned and earthy. Smoothly textured with minimal tannins, the wine’s firm acid backbone leads to a hi-strung, snappy finish. 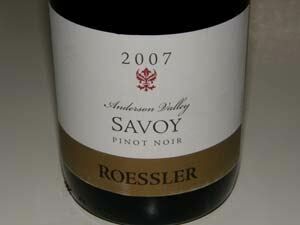 The most expensive Savoy bottling in 2007. Decent.